This looks like a promising initiative. While Shodan often hits the headlines for finding vulnerabilities such as insecure baby monitors or publicly accessible SCADA, it's great to see collaborative efforts to find and potentially disrupt malicious activities. Currently, the Malware Hunter engine comes with support for identifying a wide range of C&C servers for RATs (Remote Access Trojans), such as Dark Comet, njRAT, Poison Ivy, Ghost RAT, and more. In the future, hopes are that the Malware Hunter search engine will be able to uncover other types of malware botnets, such as those for backdoor trojans, cyber-espionage malware, cryptominers, or DDoS malware. 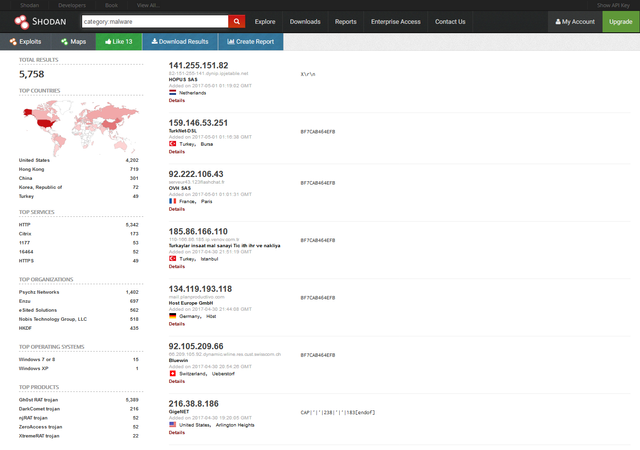 You can directly access Malware Hunter results by searching for "category:malware" on Shodan. An initial set of results — at the time of writing — lists over 5,700 C&C servers.